A Make Way for Ducklings Adaptation? | What is ML Reading? A Make Way for Ducklings Adaptation? At a busy intersection of two four-lane roads this afternoon, I wondered, “Have I read Make Way for Ducklings to ML?” Standing on a grassy shoulder at the intersection were several Canadian Geese and at least six baby geese. In my rear view mirror, I saw a police car. All players were present for a modern day adaptation of Make Way for Ducklings. Sadly, the police car did not stop and direct traffic to allow the geese to cross the street. So what I was calling in my mind “Make Way for Goslings” did not happen. Or sadly, the modern adaptation is this story. Wildlife being pushed to the shoulder of a busy intersection. When I drove past the intersection later, the geese were no longer there. There is green space in the area; so I’m hopeful they are safe and sound. Tonight I’ll show ML the book Make Way for Ducklings by Robert McCloskey. I’ll secretly celebrate if she sighs and says, “Mommy, we already read that book.” This is a classic book every child should hear before kindergarten. In the Boston Public Garden, there’s a Make Way for Ducklings Statue. I need to dig out a picture of me standing beside the statue to show ML. It was taken two years before she was born. I’ll notice the lack of streaks of gray in my hair. I wonder what will catch ML’s eye? 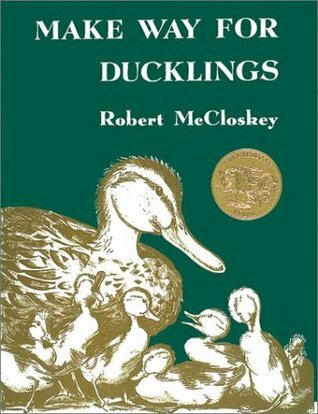 This entry was posted in Poetry and tagged Make Way for Ducklings, Robert McCloskey by mlreads. Bookmark the permalink.